We have just arrived in Honolulu and wow! It is just what the movies rave on about of Hawaii. Our journey from Australia was fantastic. We could say it was the best overseas flight we had. Hawaiian Airlines staff are very friendly and made the 10 hour journey great. We did go Business Class and went through check-in, immigration and customs in no time - within 20 minutes. The economy class line was over 100 passengers long - bloody Japanese school students who made their line snake around the check-in terminal and created at least an hour waiting time to reach the counter! They gave us passes to the Air New Zealand lounge and on top of a QVB chinese meal at 4pm we helped ourselves to their finger food. Now, once aboard the aircraft we were given a sizable dinner. So much for us losing weight whilst on this trip. Neil watch a good video on board - Red Tails- an excellent WWII movie for those war type gurus. 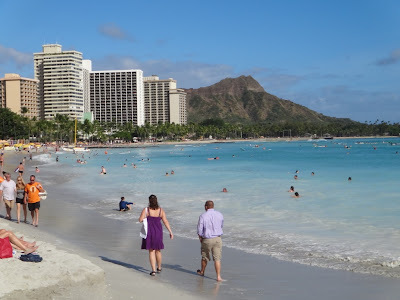 We are staying right on the Waikiki Beach and after a bit of shopping and bought clothes/shoes in view of our deliberate attempt to bring empty bags we found our way to Dukes Bar. 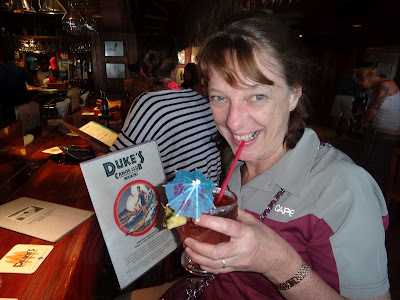 A Mai Tai and a Lava Flow and a bartender's volatile special made us chirpy with the locals. It was a good evening communicating except half-tanked Anne kept calling the people Yanks!! I have enclosed two photos - one of Waikiki Beach and the other of Anne taking in a Mai Tai. We should place another post in a couple days time when we have more interesting things to put in this blog. Tomorrow is a rest day and we should visit the Ala Moana shopping complex to buy some clothes to keep us out of trouble in Hawaii - until next time.